Mustangs and Shelbys have been brought to Telstar Motors from as far away as Florida, New York, California, Alaska, Canada, Nigeria and Japan. 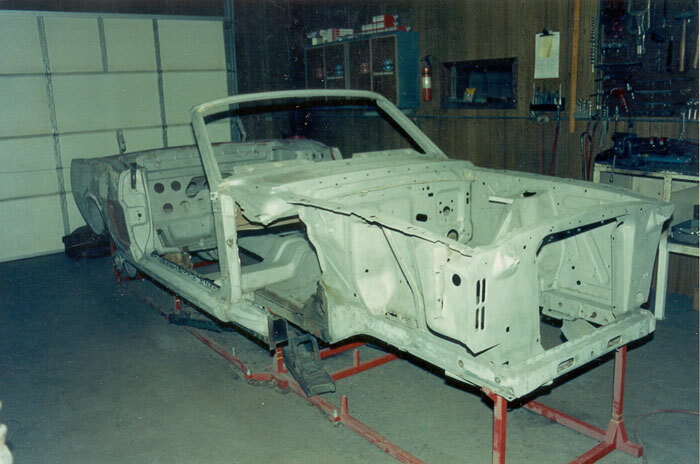 Each car is done to owner specifications, requiring varying amounts of restoration. 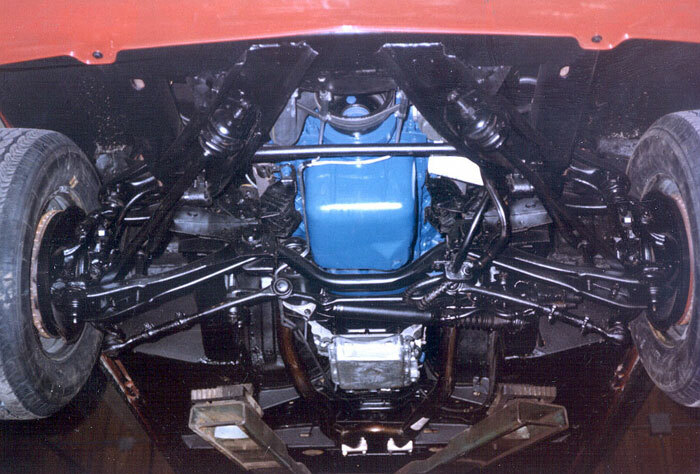 During a total restoration the cars are completely disassembled and then reassembled from the ground up. Every part is replaced or refurbished; even ashtrays and license plate lights are restored. Over 300 Mustangs and Shelbys have been restored by Telstar Motors since 1979. About 1200 hours goes into each restoration. Very close attention to detail is of utmost importance to produce the quality we require to become virtually brand new. "We are working with extremely fussy people," Jerry says. "We want the cars right and so do our customers." Fenders, doors, hood, trunk lid, entire drive train, all glass, fuel tank, suspension, grille assemblies, all lights, and virtually everything that is removable is disassembled from the car to be inspected, rebuilt or replaced. Bodies are stripped to bare metal. Cars with major rust or former collision are placed on a frame jig. All sheet metal is inspected. Any deterioration is replaced with new steel. All suspension and steering components are completely inspected and any worn parts are replaced with new. Front ends are realigned. All wiring is hand inspected, cleaned, retaped or replaced. All dash gauges, radios, speakers, lighting (interior and exterior) and all accessories are checked before final assembly. All brake lining is new. Drums and rotors are resurfaced or replaced. Wheel cylinders, master cylinder, brake lines, hoses and all hardware are inspected or replaced. Seat upholstery, door panels, pedal pads, most trim, carpeting and instrument bezel are replaced with new. Painted interior parts are repainted. Nearly all exterior chrome from grille parts to rocker panel moldings to tail light bezels are replaced with new. Wheels are rebuilt or replaced. New tires are installed. Door hinges are inspected, have new bushings installed or replaced. All convertible top mechanisms and hardware are inspected. Convertible top, rear window, top boot, pads and well liner are new. All weather stripping, seals and grommets are replaced with new. Engines and transmissions are completely rebuilt. Entire clutch assemblies are new or rebuilt. Universal joints, drive shaft, wheel bearings and seals are inspected or replaced. All four shock absorbers are replaced with new. Radiators are new or rebuilt. New hoses and clamps are installed. Engine compartments are repainted and have new specification decals. Trunk compartments are repainted and detailed, have new decals, trunk mats and spare tire covers. Body seams are recualked and sealed. Front and rear bumpers are rechromed or new. New shaded windshields and seals are installed. Motor and transmission mounts are inspected or replaced. Transmission shifters have new bushings installed and re-adjusted. New heavy duty batteries, battery trays and cables are installed. Power steering units are inspected or rebuilt. New hoses and seals are installed. Alternator, voltage regulator, heater fan and all sending units are tested or replaced. Window regulators and door latches are inspected, cleaned and lubricated. Most small metal parts including nuts and bolts throughout the car are inspected, rethreaded, sandblasted and painted before installation. Upon final assembly, all doors, windows, hoods, fenders, trunk lids, bumpers, grille parts, etc. are hand fitted and aligned. 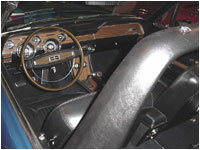 In addition to the above, many details too numerous to mention are performed during the restoration process, including new owner's manuals, hand painting instrument needles, replacing glove box inserts, new screws, bushings, switches, wire ends, fuses, grommets, etc. BRING US YOUR MUSTANG OR SHELBY! WE WILL CUSTOM BUILD IT EXACTLY TO YOUR SPECIFICATIONS.